Forewarned by friends with local knowledge, I suspected that my small painting boards wouldn’t be sufficient to capture the wide open skies, and extensive horizons that would surround me in this part of the world. As the weather began to close in around my plein air practice, it was time to turn my attention to the Northern European tradition of landscape painting. You learn little from the colour reproductions of fine art books, other than composition. To really understand the dynamics of a work’s construction you have to see it directly. So, I headed over to Amsterdam, first to the renovated Rijksmuseum primarily for Ruisdael and Cuyp – two painters referenced by Graham Crowley at ASC through Zeitgeist Arts educational development programme (a great resource for those unable to fund further formal education). I was particularly struck by the treatment of clouds, how the bold use of white mixed into the blew threw the surrounding clouds into a modern-feeling relief .. in the 17th century! 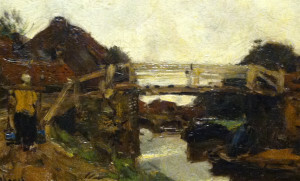 Another insight visit was completed by surveying the 19th century Dutch Realist School landscapes. 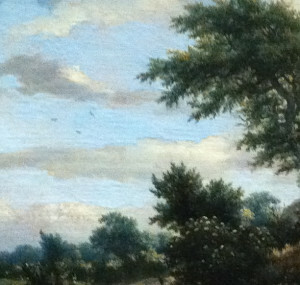 This detail of a work by Maris retains the influence of classical Dutch landscape, with added fluidity of brush stroke. Needless to say, I also sat in admiration of Vermeer’s Milkmaid, with the faultless colour harmonies, and pointillist treatment of the light falling on her face. 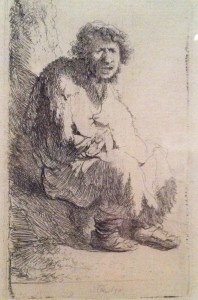 And, well, all those Rembrandts… Who say’s we can’t learn anything from history?